The CSUDH women’s basketball team has had a roller-coaster of a season. They had a hot start, winning six out of their first nine games, but things took a bad turn as they lost seven of their next 10. However, thanks to a four-game winning streak, they currently find themselves at 7-7 in the conference (11-9 overall) and in seventh place, good for the playoffs if they can hang onto that position, or improve, with eight remaining games. The team claimed big wins last week against playoff rivals. On Thursday, Jan. 31 they defeated ninth-place Sonoma State, 61-50, and on Saturday, Feb. 2 eighth-place San Francisco State, 85-69. The returning players have set the tone for the program this year. Senior Nautica Morrow leads in team points with 273 and in assists with 44. Junior Ahlisha Henderson leads the team in rebounds with 157 and in blocks with 24. 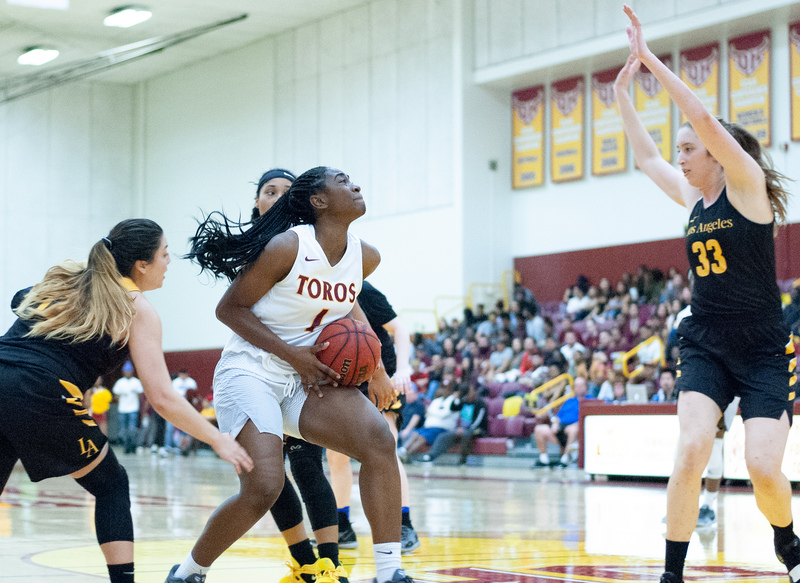 Thanks to four-game winning streak, the lady Toros are in the mix of CCAA playoff contention. “Everyone has contributed but all of our returners have set the tone to know what is expected within the team,” said Bonner. Senior Heaven Holmes was averaging 50% from the three-point line, but suffered an injury early in the season and hasn’t seen action since Nov. 10. That was a tough loss for the team, as she was expected to be a key player this season. With four freshman and two sophomores, Bonner said the key for the final stretch of the season is how they respond to the pressure. Up next: The Toros are home against Cal State Monterey Bay Feb. 7 at 5:30 p.m. and Cal State East Bay Feb. 9 at 1 p.m.